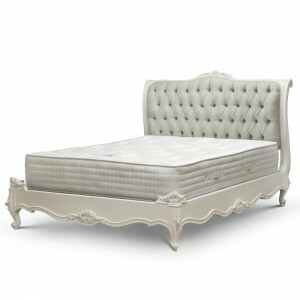 The French style 3ft linen bed is perfect for guest bedrooms. Featuring a neutral linen fabric and an antique white painted finish, this French bed brings beauty and class to any bedroom. Match this bed to our Provencale style bedside cabinets or our antique white bedroom furniture to create a wonderful French style boudoir. Note: This item may require assembly upon delivery at an additional charge, please enquire with our sales team.